so it moves of its own accord, unsteady. all of whom are away. Her body speaks to her husband. she falls asleep, smiling, not knowing that she is smiling. as a red tide rises inside her skull. that will fill the holes in his collection. the one far, far in the back of the collection. eating one comic book after another. He does not hear the empty house. the telephone receiver overturned in the living room floor. regaining his sight after a battle with the Red Skull. as they lie in their tended beds--decay, completely unaware of him. holds only two branches in its entirety. America, now that you've fucked me, pay me! Pay me my severance so that you can walk away. Would it be that much easier if I went away? just in case of rainy days and governmental coups? reason I happen to make up this week? Then what? Peace? Do all of humanity's murder plots cease because I give up mine? honestly make such an argument? No. Of course not. that I am the one and only God of War. So I take some time off. will eventually follow its own path to Truth, to Utopia. beneath mere millimeters of flesh. how much of yourself you see when you look at me. Copyright 2008, Jason Mott. © This work is protected under the U.S. copyright laws. It may not be reproduced, reprinted, reused, or altered without the expressed written permission of the author. 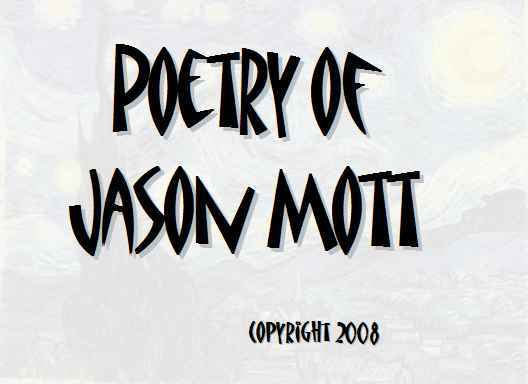 Jason Mott has recently received his MFA from UNC Wilmington. He has published fiction, poetry and nonfiction in various journals including The Kakalak Anthology of Carolina Poets, The Thomas Wolfe Review and Measure.